Today’s hotel guests are savvier than ever. Their needs and expectations have evolved and hotels need to keep up in order to keep guests coming back. That’s why hotels seeking a total unified technology solution turn to Broadband Hospitality. Our collaborative, guest-centric approach is customizable, scalable, and always cost-effective. We understand that your guests always, always come first. Our solutions are designed to help you exceed their expectations when it comes to every aspect of their stay and ultimately deliver on that truly distinctive guest experience that will set your property apart. We work with hotels each step of the way to ensure seamless planning, installation and deployment. Our committed “front lines” approach gives you the freedom and peace of mind to let us handle all of your communications needs while you continue to serve guests. And that’s why the hospitality industry considers Broadband Hospitality a total unified technology solution for hotels seeking the right technology solutions to meet guests’ needs, today and tomorrow. Fast, reliable and fully supported 24/7. Guests immerse themselves in the ultimate, high-def experience. Customizable and always cost-effective Cloud PBX and analog phone solutions. We ensure your efficient build-out — or seamless upgrade — from start to finish. Custom wiring solutions that align with your property’s requirements, needs and budget. Capture and monitor every inch and angle of your property to maintain a safe, secure guest environment at all times. Cutting-edge AV that resounds with your guests and staff. 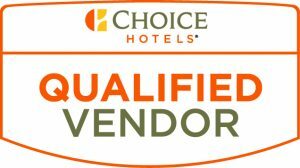 Broadband Hospitality is proud to be a member of Choice Hotels Qualified Vendor Program. We are a Choice Hotels Qualified Vendor for: Fiber, CCTV, PBX Phone Systems, TV Solutions (via DIRECTV) for all brands. Additionally, we are the exclusive provider of Guest Wi-Fi for WoodSpring only.